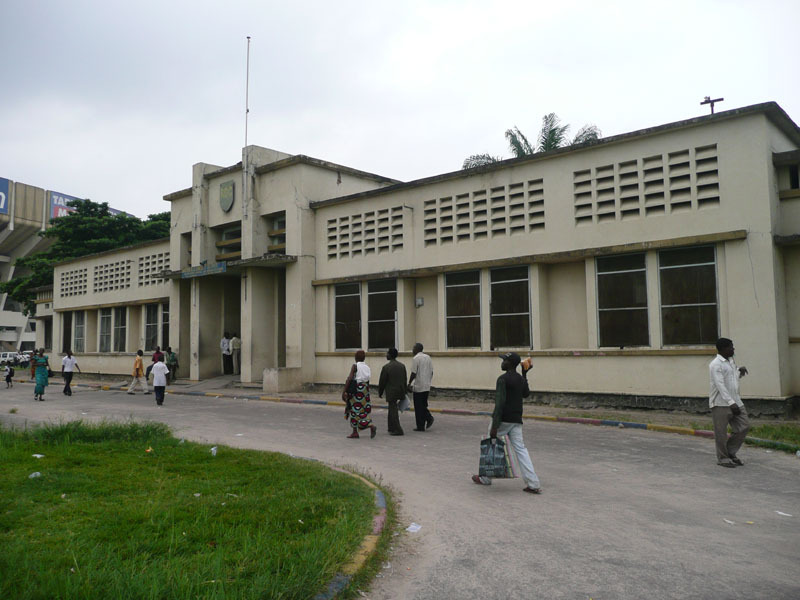 Kinshasa’s city hall, the Hotel de Ville, is getting a new annex. 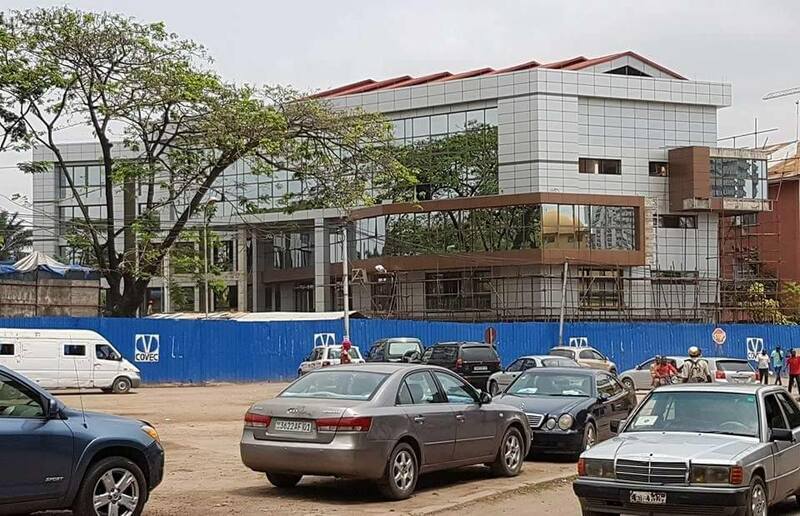 The four-story building on Ave. Ebeya, launched in November 2014 with a 9-month construction time frame, includes interior parking for 30 vehicles, offices for the Governor and Vice-Governor and conference facilities on the top floor. An air bridge will connect the new structure with the original building. 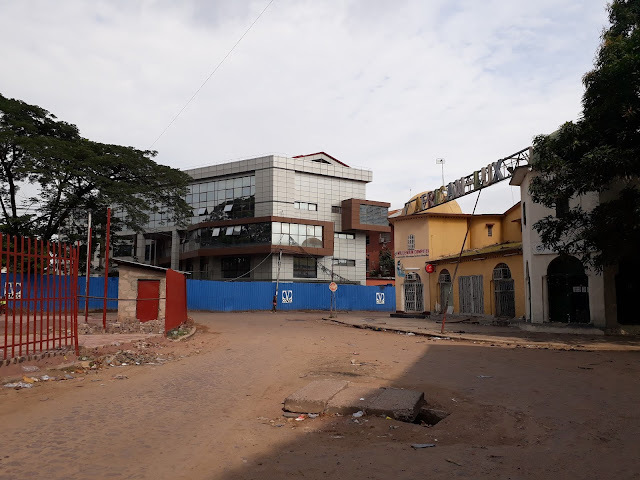 Critics charged that the municipal authorities were planning to sell the existing structure to a third party. Robert Luzolanu, Provincial Minister of Plan, Budget and Infrastructure denied these allegations, arguing the emblematic building “embodies the identity of Kinshasa”. 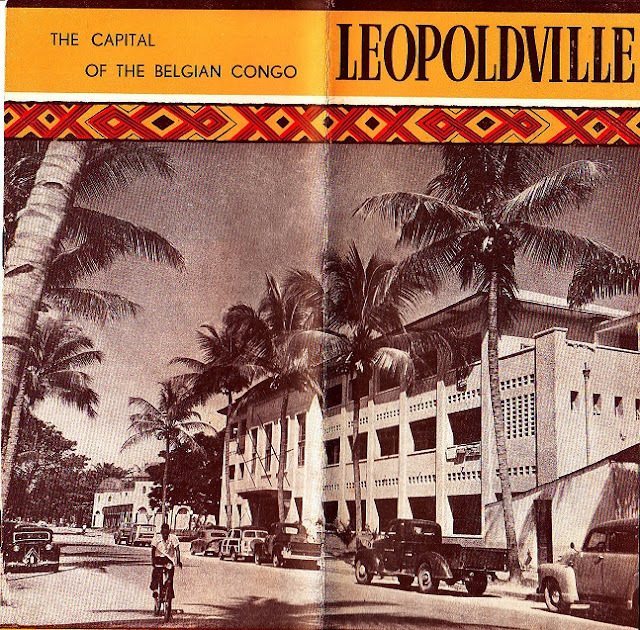 The Hotel de Ville was originally built for the Office du Travail de Leopoldville (Offitra), a labor bureau established in November 1922 to recruit workers for large public works projects around Leopoldville (Moyen-Congo) and the reconstruction of the railway between Matadi and Leopoldville (Bas-Congo). The three-story building towered over the rest of the cité as it existed at the time. The number of laborers recruited and housed at Offitra’s camp at Ndolo grew from 934 in 1923 to 5,108 in 1925. Pneumonia, meningitis and venereal disease were chronic health threats and Offitra organized vaccination campaigns to immunize its workers against these diseases. 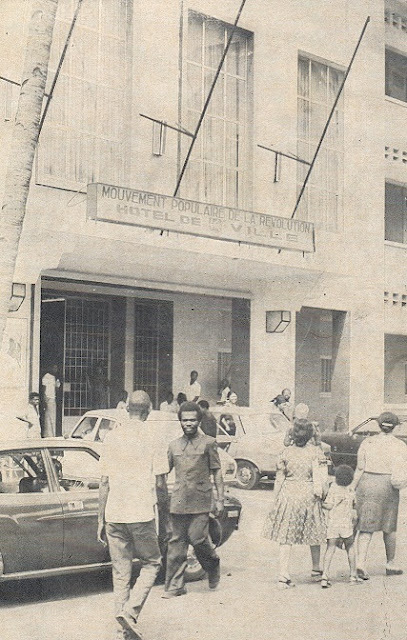 It was at this time, as well, that the Red Cross established its clinic in the cité to treat venereal disease in the growing municipality (See Mar. 1, 2014). The Office du Travail shortly after construction. The same view with image reversed. 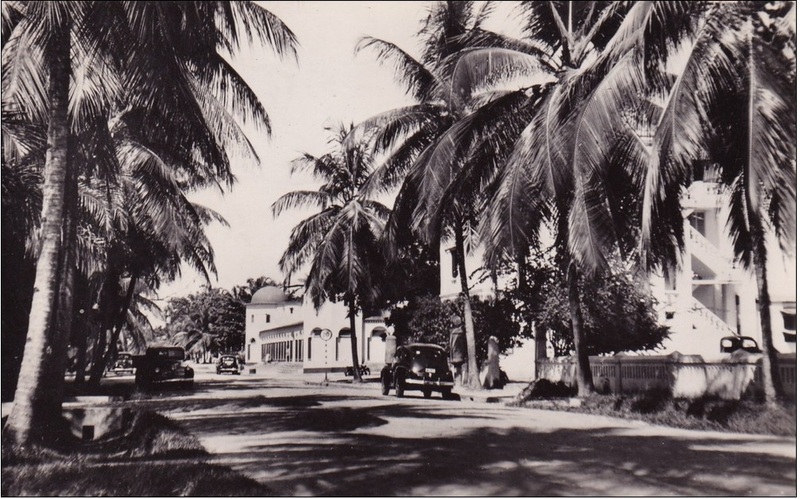 In 1934, following the centralization reforms of 1933, the new District Urbain, as the municipal government was termed, moved into the building. Local government functions established here managed the entire urban district. A Comité Urbain named by the Governor General, drawn from the elite ranks of the business community, decided urban development priorities under a Commissaire de District Urbain, a senior member of the Territorial Administration. The District Urbain with the Leopoldville coat of arms hanging from the second floor. 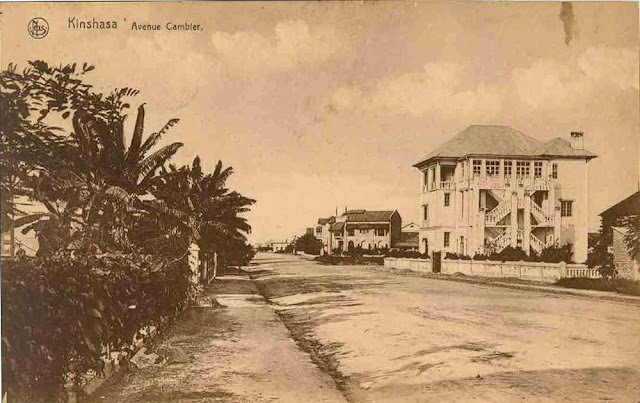 Looking east on Ave. Cambier - note exterior stairs prior to construction of an extension in the 1950s. In the years approaching Independence, the District building became known as the Service de la Population Blanche, attending to the European population residing in Ngaliema, Gombe and Limete Communes, while the African jurisdictions of the city were managed by the Service de la Population Noire built in 1951 near what is now the Stade des Martyrs. 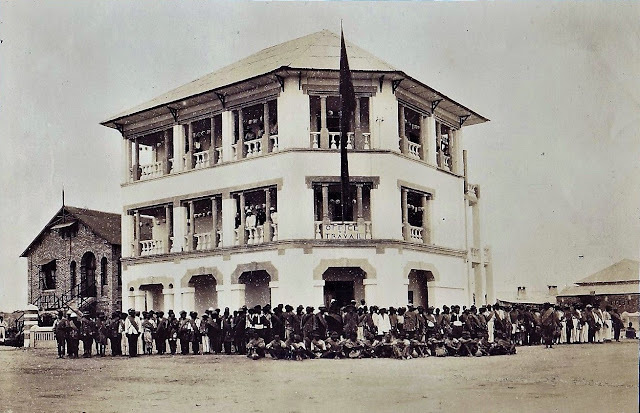 After the Communal Elections in 1957, a Belgian Premier Bourgmestre presided over a Conseil de Ville at the Hotel de Ville which included Congolese Bourgmestres from the newly-created Communes. The Hotel de Ville with extension at right. 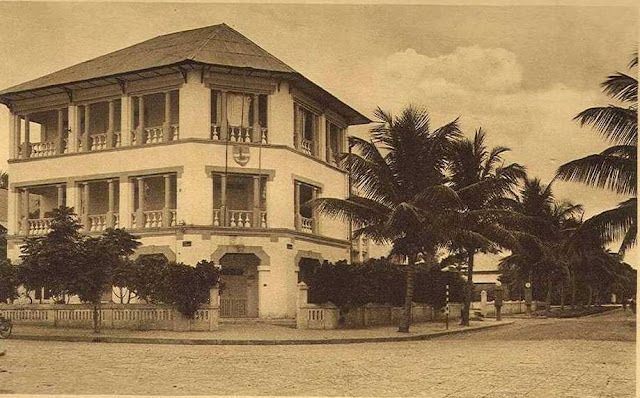 After Independence in 1960, the Hotel de Ville managed the entire municipality that came to cover 24 Communes by 1968. Administratively, Kinshasa became both a municipality (Ville) and a province within the national provincial structure established by Mobutu after his take-over coup in 1965. 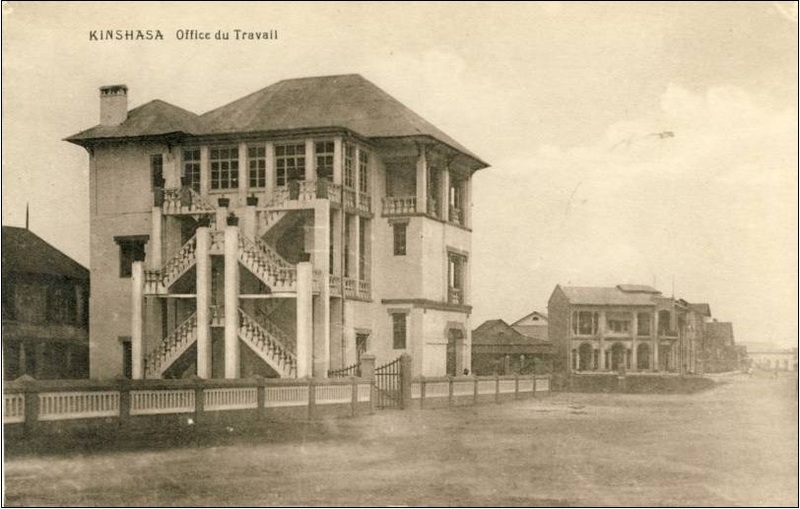 An earlier annex behind the Hotel de Ville - this structure is visible in the Office du Travail photo at top. 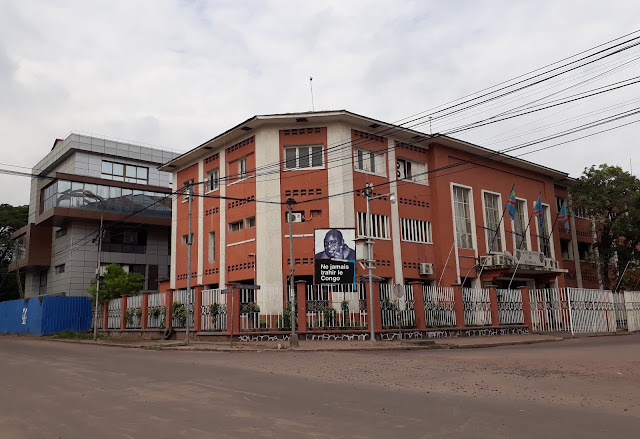 On February 26, 2011, Kinshasa Governor Kimbuta inaugurated a three-story Provincial Office building a few blocks west of the Hotel de Ville on Ave. Ebeya. 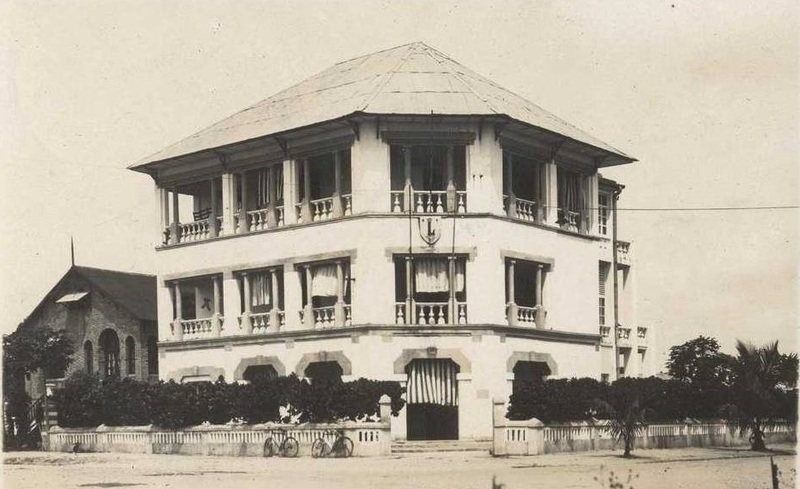 At the time, Minister Luzolanu asserted that this new facility addressed all existing space constraints at the Hotel de Ville. However, three years later, the city decided to build the Annex and requested a waiver from national competition to award construction to a company called COVEC (China Overseas Engineering Group) in order to address urgent space constraints faced by the municipality. Critics questioned why a comparable building for the Hotel de Province cost $4 million while cost for the Annex was announced at $6 million. As of this writing, the construction fences are still up around the new building. Hello! I love this blog, mostly because I am writing a book about the Congo in the 60s, and it's been an incredible resource for getting to see what it looked like. Thank you. I would love to chat a little about the city if you have a moment -- ravi.somaiya@gmail.com. Thank you!